Benefits of Social Media Marketing to small & large scale business .Social Media Marketing (SMM) is the way of advertising your brand, product and business to an audience over social media. The core focus of the article will be on the benefits of social media marketing, but before going for it, we’ll first have a look on what is social media marketing? Why we need it? What are the goals of social media marketing (SMM)? What are the strategies of social media marketing (SMM)? What is the life cycle of social media marketing? Social Media Marketing (SMM) is a type of internet marketing. It is a way of marketing your business over the internet specifically on social media websites like Facebook, Twitter, Google+, Pinterest, LinkedIn, YouTube and Reddit. Social media marketing basically covers the activities like sharing of videos, images and contents for the sake of marketing. Because of the immense benefits of social media marketing, you should first learn why we need it? Why we need Social Media Marketing? With the passage of time, the world has changed into a small village. Each and every person around us has accounts on social media sites. The immense use of social media has made it need of the day for market on them as well. Because of the huge number of visitors on social sites and higher Page Alexa made it mandatory for marketing purpose. Marketing on social media sites can bring remarkable progress in your business. Social Media Marketing help you to build strong relationships with your customers and make your site more popular. What are the Goals of Social Media Marketing? What are the Strategies of Social Media Marketing? To achieve your client's desired benefits from your social media marketing, make your strategies very carefully. Social media marketing campaigns without social strategies is just like moving to way without knowing your destiny. That’s ultimately results in lots. Social media strategies may vary from domain to domain with respect to their domain sizes and business goals. Social media marketing strategies can be made by Platform, Podcast (Audio Recording), Presentation (Power point), Content, Keywords, Article Titles, Images and by Videos. Social media strategies basically use activities like as follow. Social Media Plan_Listed with number of steps to achieve business goals. Unique Content Writing_Creates unique post for each social media site. Consistent Brand Recognition_Will maintain the new positive image of your business in the market. Blogging_Write minimum 400+ words’ in your blog & share with other social communities. Link Building_Create mature business profile on all social sites with complete required details & link with business website’s About Us page. Competitor’s Tracking_Keeps an eye to your business competitors’ in the market. Success Measurement Techniques & Tactics_To measure the end results, where you end up. 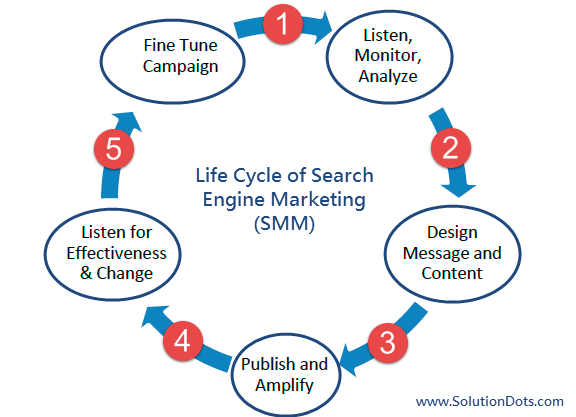 What is the Life Cycle of Social Media Marketing? 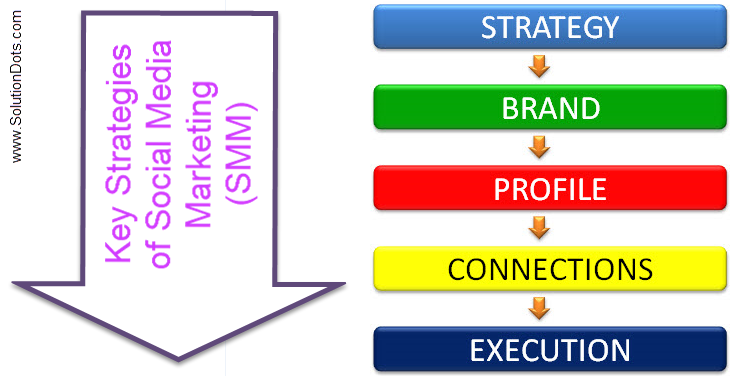 The below picture is giving you an understanding regarding the life cycle of social media marketing. Now we’ll discuss 15 amazing benefits of social media marketing for your business. That ultimately leads your business to the new level. The 1st benefit of social media marketing is catching more traffic. Social media sites provide you ease to contact your targeted audience in an efficient ways. Geo-Targeting is an efficient way that helps you to communicate with your audience by location. Social websites like Facebook & Twitter have featured tools that let you communicate with the audience irrespective of their geographical locations. You can simply set the location features as per your desires. For example Hootsuite’s Social Media Management gives you customizing features to post by location, language, gender and relationship status. The 2nd benefit of social media marketing is learning about the needs of your targeted audience. Know your audience is the key of a business success. Social media have accomplished this need quiet easily. In order to reach more audience you just need to make efficient use of social media listening software like HootSuite, Sendible, SproutSocial. By this you can learn the most spoken languages of audience on social media & their age & gender etc. This knowledge will ultimately benefit your social media campaigns in order to update your social media marketing plan significantly. You can track your customers’ interest and their behavior towards your post, video or other stuff. The 3rd benefit of social media marketing is increased in your audience. The most significant feature of social media marketing is the easiest way to reach huge numbers of customers. Social media is the cheapest channel to communicate with your customers. By this you can find your potential customers. New social sites are the most common ways to interact with your clients 24 hours 7 days a week. The 4th benefit of social media marketing is the fastest response from the audience. Social media has made an easy approach to your customer. By social media you can communicate & interact with your potential clients publicly. You can brief out your service level, service description & their charges. You can publicly thank to your customers on appreciated remarks and apologized for the bad experiences. You can rescue their issues & complaints on the spot by having their personal information. The 5th most important benefit of social media marketing is the tack about competitors. Social media has changed the whole world as a small village. You can visit your competitors profile publicly and can keep a track about their services, charges, new events, discounts and sales, etc. Such things will eventually help you keep updated about market trends & new techniques. Through these followings you can manage the proactive activities to take your business at the dreamed level. The most important feature of social media marketing is the higher ranking of your business website in the search engine’s search results. The Greater number of visitor/audience on your business website will greater it’s ranking on social search engine. Although SEO is the best way for catching more audience, but at some points we become stop working. Check my article SEO Services Provider in Saudi Arabia. At this point we can easily get benefits of social media marketing. In short, we can say that you cannot get search engine ranking until you won’t have a strong profile of your website on social media. As compared to the past now internet marketing has been taking all over the world. Social media marketing has minimized the challenge was faced by the marketers in past. Social media has given benefits of reaching your customers in the shortest time. You can share content, post, video and services at just one click. Such amazed benefits are mind-blowing own their own. This simplest sharing of content about your business on your social media accounts can cause huge difference. You just need to notice about the options of letting share, your shared content further. The most important benefit of social media marketing is its lower cost in comparison to the other internet marketing techniques. More than 84% marketing persons thought that 6 hours working is more than enough to catch more traffic. In this regard, we can say that minimum hours of working can generate massive results. So we can conclude that social media marketing is far cheaper than other marketing techniques. Social media allowed you to market your ads on cheap rate that are usually in reach even for organization of smaller domain size. Immense usage of social media sites is a big source to stay connected with your customer/clients. Your social business profiles keep you in linked with your potential customers. Your social profiles provide an option (Follow/ Subscribe to Newsfeed) for your customer to stay connected after one good experiences, these features are remarkable that the old advertising techniques never had. This long lasting relation with potential customer finally leads to the marketing of your good services from one happy customer to another. The utmost benefit of social media marketing is your brand recognition. No matter how authentic and beautiful content you have on your business website. It is useless until your work isn’t getting appreciated by others, this is what actually boots your morals. Social media is a great way to increase your content visibility. It is very important to avail this opportunity and raise the voice of your brand over social media. The frequent usage of social media posts opens the new door of your brand recognition and raises the chances of its familiarity with new customers. The presences of your business profile on different social media websites, higher the ratio of new customer’s trust for you. That will finally help in your band’s identity. One the most stunning benefit of social media marketing is that it provides you higher conversation rate. Social media is the only channel on internet marketing where you brand acts like a human. This humanization factor, of your brand allows business profile to work like humans, and communicate with other humans not with other companies/organizations. Social media provide to ease to track the conversation rate of your post. You can view your followers, people’s likes, shares/retweet etc. A recent research has shown that social media gives more than 100% lead rate over outbound marketing. In short, we can say that building more traffic on social media, improves conversation rates on current traffic. There are many ways to increase your traffic through social media. Past 4 year analysis has shown that top 5 social media sites like Facebook, Twitter, Google Plus, LinkedIn and Pinterest are a good source of inbound traffic. Each social media site lead back to your business profile. Every single content is directed to business website that is basically raised your outbound traffic and its visibility to new visitors. Social media marketing strongly influences your audience on social media for being loyal. Companies should take benefit of the marketing tools shared by the websites’ of social media. These are precious sources of catching more audience and make them loyal to your brand. According to the Report Generated by Texas Tech University, brands that have profiles on social media channels are enjoying a higher loyalty level from their customers as compared to the rest. Everything you shared from your website’s blog posts, videos, images and comments build the new followers. That might be your new visitors, old customer or the recent customers. Every interaction does result in conversation, but positive interaction results more customers whom you can interact simultaneously. Every article we post on social media platforms is an opportunity of visitors for convert into customers. The greater the number of your interaction (on a regular base) with your followers/customer/visitors grater will be the faith of your customers to your brand. When people admire your brand or complain about your services you can officially thank and excuse simultaneously. Obviously, these things will boost your brand’s positive image as well as help your future customers to know about genuine profile on social media. At last we conclude that Benefits of Social Media Marketing is a new innovation in the field of internet marketing. No brand, organization or companies can marketized successfully, until they do not run their campaigns on social media. The longer you wait the more you will lose. Join SolutionDots social media marketing services to get more leads, conversation, traffic and search engine ranking. Staying connected with your customers on social media gives you immense benefits that finally gained more revenue and higher your brand identity. Thank you for your visit. For more informative posts...Stay Connected!